Sustainability exists from the day it was originated by the Brundtland commission in the year of 1987. The term sustainability has been vaguely defined and it created different interpretations. In line with today’s current situation, organizations are increasingly perceived sustainability as an opportunity for them to gain competitive advantage. Most of the organizations only measure the business sustainability from the economic point of view without considering other factor which could lead to sustainability such as environment sustainability. Sustainability aims at merging the benefits of the environment activity with the principle of sustainable development. In the current era, most of the powerful brands are aspired to achieve the same sustainable goal, hence the business leaders and marketers are now facing a problem to maintain its environment sustainability. Most of the studies investigating environment goal from the perspective of business operation. Apart from measuring the business by looking at the tangible asset, it is important to measure it from the perspective of customers. Based on the multiple regression analysis, the result of this study showed that only brand dominant strategy and Halal strategy were proven to have significant relationship on economic sustainability. 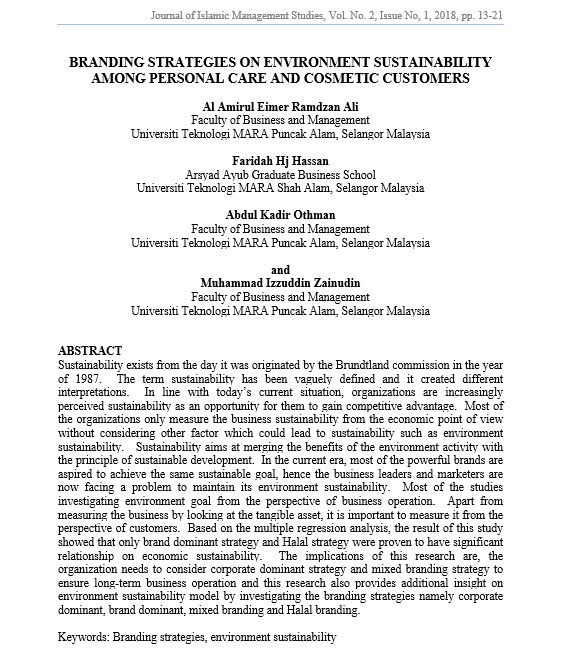 The implications of this research are, the organization needs to consider corporate dominant strategy and mixed branding strategy to ensure long-term business operation and this research also provides additional insight on environment sustainability model by investigating the branding strategies namely corporate dominant, brand dominant, mixed branding and Halal branding. RAMDZAN ALI, Al Amirul Eimer et al. BRANDING STRATEGIES ON ENVIRONMENT SUSTAINABILITY AMONG PERSONAL CARE AND COSMETIC CUSTOMERS. Journal of Islamic Management Studies, [S.l. ], v. 2, n. 1, p. 13-22, mar. 2019. ISSN 2600-7126. Available at: <http://publications.waim.my/index.php/jims/article/view/102>. Date accessed: 24 apr. 2019.